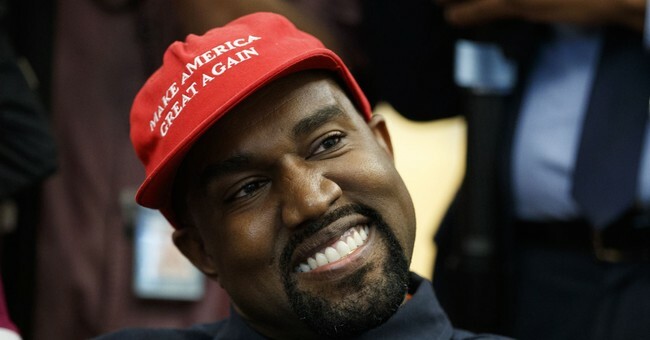 When Kanye West visited the White House a few days ago, the rapper made a rather interesting statement about President Donald Trump and how close the two are. He said Trump is like the father he never had and that wearing a Make America Great Again hat makes him feel like Superman, Deadline reported. “My dad and mom separated, so I did not have lot of male energy in my home. Also, I’m married to a family that does not have a lot of male energy. It’s beautiful, though!” Kanye explained, referring to his wife, Kim Kardashian's, family. The rapper went on a 10-minute soliloquy about his past and how he feels about Trump. “There is something about when I put this [MAGA] hat on that makes me feel like Superman! That’s my favorite superhero. You make a Superman cape for me,” he said. Kanye also talked about his recent appearance on Saturday Night Live where he wore his MAGA hat. "What I need Saturday Night Live to improve on, the liberals to improve on – if he don’t look good we don’t look good, this is our president!" he said, pointing to Trump, who sat behind him. Trump smiled and approved of what the rapper said. “He can speak for me any time he wants. He’s a smart cookie. He gets it," the president said. " [He] could very well be” a future presidential candidate. Of course, Kanye's response was simple: "Only after 2024." This dynamic relationship will be interesting to watch, even after President Trump leaves office. If Kanye does consider running for office, would Trump stump for him? And would this father-son relationship continue outside of politics?